The United States won’t invade Iran anytime soon—just look at what North Korea has gotten away with. How do you know President Obama is bluffing when he talks about taking military action against Iran and that “all options are on the table”? Because Vice President Joe Biden told AIPAC that Obama isn’t bluffing. We’ve heard this kind of talk from the Administration for over a year now, and maybe they even mean it. But the audience Mr. Biden and his boss really need to reach is not at AIPAC. It’s in Tehran. And so far, the mullahs show every sign of thinking the US is, in fact, bluffing. If Mr. Obama really weren’t bluffing, we would be adding to our military strength in the region, and toughening our position at the bargaining table. That we’re doing the opposite tells Iran that the Administration is bluffing after all. True enough. Of course, the consequences of an attack on Iran would be catastrophic to American interests, including the fact that Iran would then dig tunnels deep and store uranium everywhere in search of a bomb tout de suite. Western nations did not accomplish anything that can be construed as a concession, and instead they admitted Iran’s rights only to a degree. To assess their integrity, we must wait until the next round of talks. The fact that Khamenei allowed as how the West has accepted Iran’s rights “to a degree” is a hopeful sign, and an important change in tone. 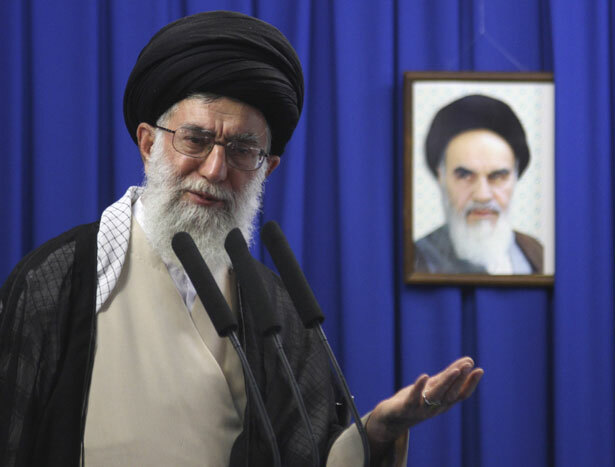 But the bottom line remains the same: the United States has to offer to remove economic sanctions on Iran and to accept Iran’s right to enrich uranium in exchange for Iran’s agreement to allow intrusive IAEA inspections of all sites involved in the program. But, as always, so far Iran does not have enough 20-percent-enriched uranium to make even one bomb, and a lot of the uranium has already been converted into fuel rods that can’t be used for bomb making. Moreover, there’s utter confidence that Iran has not diverted any of its uranium, under IAEA controls, into a weapons program. On top that, not only does Iran not have “the bomb,” but it doesn’t have the means to deliver one, and it’s not clear that Iran has the knowhow to manufacture a working device, at least not for a few years. So if Obama is bluffing anyone, he’s bluffing the American people, who still like their presidents to carry a big stick. Rand Paul’s filibuster revealed that the administration has toyed with using drones against Americans at home—can a senate investigation now take the CIA to task on torture?